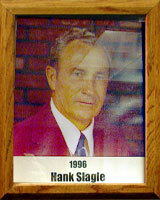 Hanley “Hank” Slagle grew up in Phoenix where he graduated from Union High School in 1934 and was an academic honor student. He played on the basketball and baseball teams that twice won state titles. Hank graduated from the University of Arizona in 1938 with a bachelor’s degree, followed later by his master’s. While at the UA, Hank played on the basketball and baseball teams and became a member of “Pop” McKale’s all-time baseball team. His 1937 batting average of .506 still stands as a UA record. In an interview with Abe Chanin, Arizona Daiy Star sports editor, McKale once stated that he considered Slagle and Bryce Seamon the most valuable players ever to play for him. Hank played professional baseball on several minor league teams, including the San Francisco Seals. He coached Tucson High School to 10 state baseball championships. His teams won 46 consecutive high school baseball games, a state and national record. Hank was named to the 1937 All-American National Semi-Pro Baseball team; chosen Coach of the Year by the Arizona Daily Star, and had the Arizona Coaches’ Association 1975 All-Star Game dedicated to him. He was the first principal of Rincon High School and at Santa Rita High School. He also served as president of the Arizona Secondary Principal’s Association and was a board director of the National Association of Secondary School Principals.